Animals are a source of great comfort in time of need. 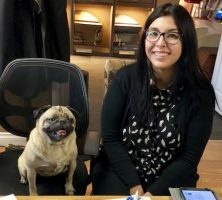 Dogs, in particular, have earned the moniker “Man’s Best Friend,” despite intense competition from cats, rabbits, hamsters, lizards and more. 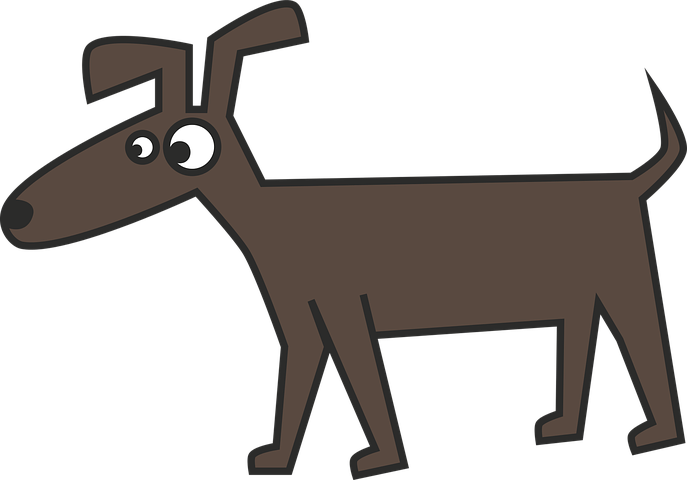 Experts agree that canines possess the unique ability to sense when their masters are troubled. Whether they hear sniffles or see tears, they often run to their owners to offer a lick or snuggle up when the going gets tough. As a result of their innate sense of how and when to render aid, dogs make perfect therapy animals. 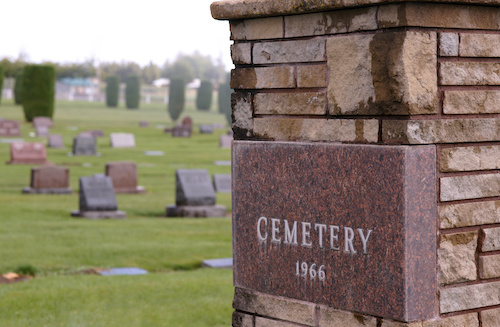 They serve in a number of arenas across the world, from natural disasters to assisted living centers, from hospitals to schools and (our personal favorite) …funeral homes. 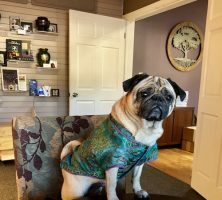 A proud member of the Foothill Funeral & Cremation family is Lola, our bereavement pug. 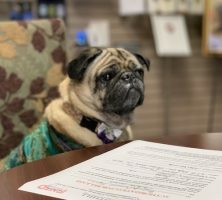 She was trained to be a bereavement dog and has nearly completed her certification. 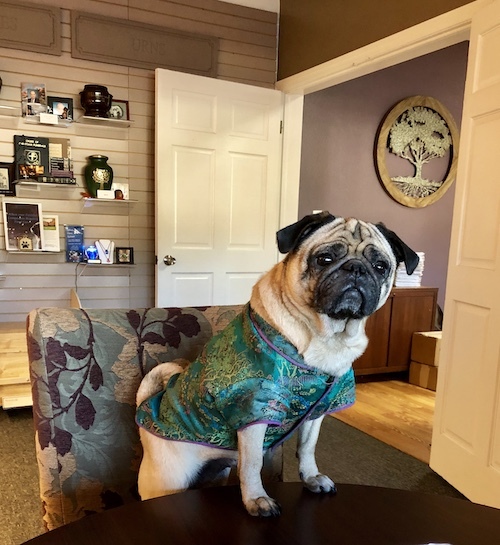 Weighing in at 23 lbs., Lola cheerfully greets families and wanders the halls of our Glendora showroom on a regular basis. 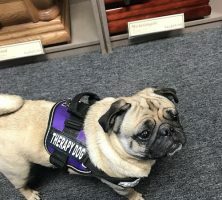 The National Funeral Directors Association (NFDA) does not track the number of funeral homes in the U.S. with therapy dogs. However, the number has risen significantly over the last few years. 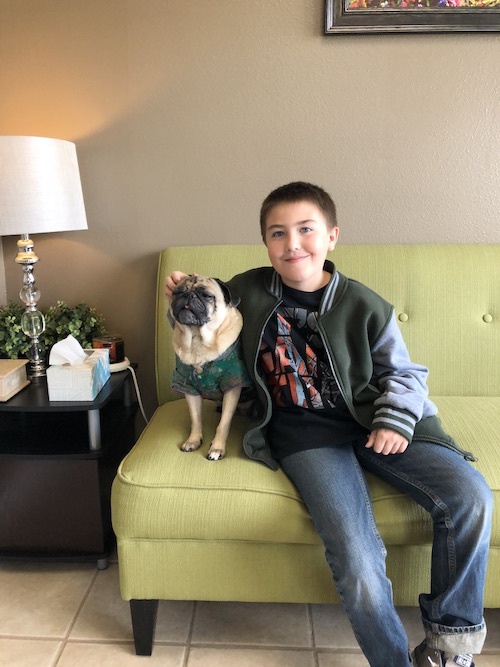 Since imitation is the sincerest form of flattery, we take it as a compliment that bereavement dogs have joined the ranks of mortuary teams across the San Gabriel and San Fernando Valleys as well as the Inland Empire. 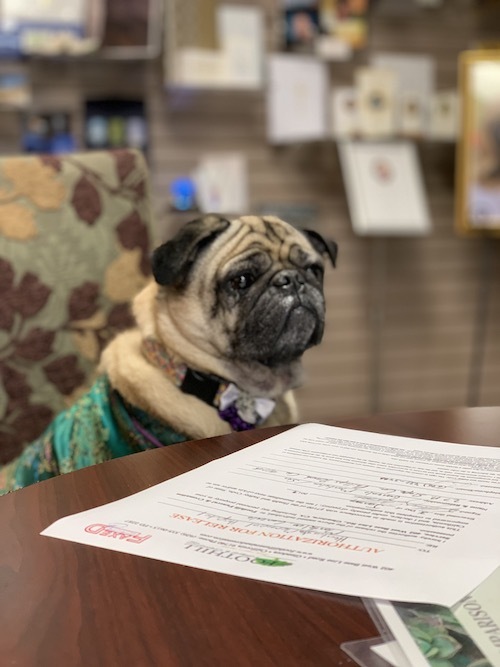 Our Lola is five years old and has spent her entire life in a funeral home. She greets our families and will accompany loved ones to their service at the request of the family. She has a special bound with grieving children and does her best to bring them comfort. 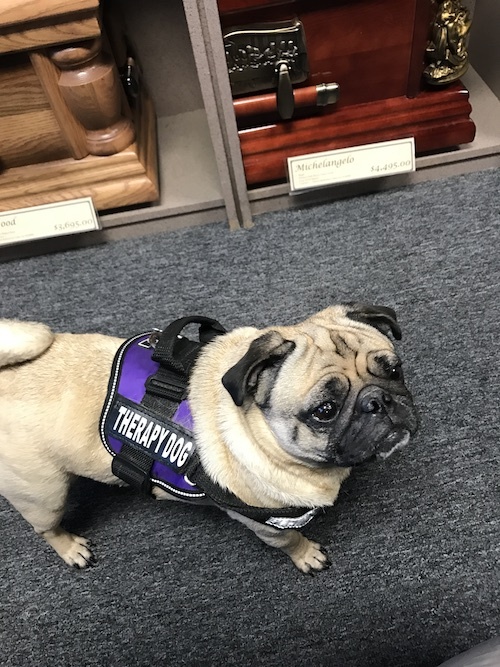 Not only do therapy dogs provide comfort, they improve overall mental and physical health. 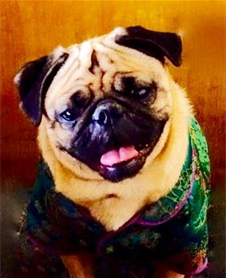 For example, petting a therapy dog increase serotonin and dopamine levels in the brain. This improves mood by lowering stress, anxiety and depression. 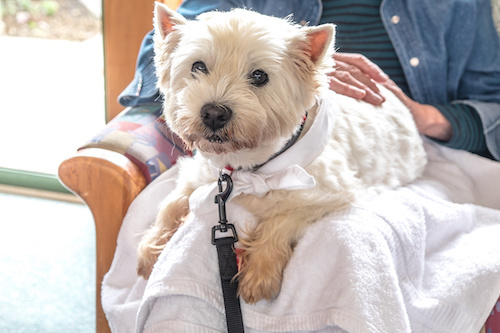 Interacting with a therapy dog also lowers blood pressure and helps the lonely, which is how people often feel immediately after losing a loved one. 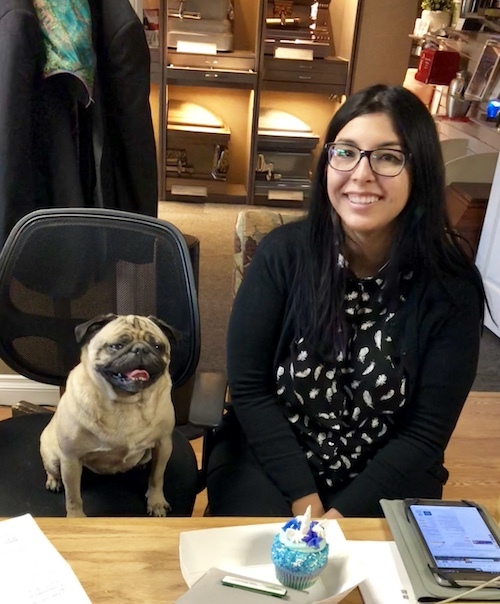 So, we invite you to come by our Glendora showroom and say, “Hello” to Lola. She (and we) will be glad you did! My daughter, Elianna passed away at the tender age of 12 in August 2011 from a brain hemorrhage. Elianna’s passing was very unexpected, and it was a shock to our family and the community. We will always remember her, the young girl with the radiant smile and the most beautiful mane of red hair. She had a caring heart and inner beauty that sparkled within and radiated on the outside. She was our eldest child. The pain of losing a child is one of life’s harshest blows to a parent. The grief is unfathomable, and I would not wish it upon anyone. A tragedy does change us because, in time, we start to look at life from a new perspective as we continue. We begin to grasp onto our faith which helps give us the strength we need to pull forward. Faith also helps us see the meaning of life and death and that death is just the beginning of a new life in heaven. 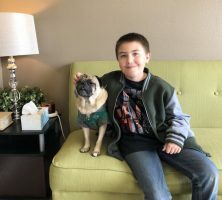 I have learned so much about my pets and how they have helped me through my grief. I would lay with all three of my dogs for hours until I had no more tears to cry. They would comfort me and listen to me in their unique way and would act as silent, loving companions giving me the love and attention I needed. I do believe to this day that Elianna was sending energy through Ace, her beloved dog which we sensed when we stroked and cuddled him. Sadly, Molly, Pepper, and Ace are no longer with us, but I will never forget their loving presence and how they comforted us during the darkest time in our lives.